Ringo's hair clip at the British Embassy, Washington, February 11 1964. "After the performance [at the Washington Coliseum, Feb 11 1964] the Beatles appeared as honored guests at a British Embassy charity ball sponsored by Ambassador and Lady David Ormsby-Gore. The cream of capital society gawked at and mauled the Beatles, in some cases going at them with scissors, intent at snipping off locks of that famous hair, and John stormed out in a huff." I pointed out that, as well-known as this story is, there are many variations on it. There are discrepancies as to whether the attacker was a male or female, how old the person was, whether or not he or she was successful, and which Beatles expressed their anger and in what manner. Here is a collection of first-hand accounts, starting with Ringo's telling of the story on his Ringo's Yellow Submarine radio series (1983). Ringo Starr: And while we were in Washington we were invited to the British Embassy for a party, which was very nice of them, but I had a horrendous time. Besides, we didn't know anyone and most of the people there didn't relate to music in any shape or form, and after they had a few drinks they got really silly and one guy turned, he was such a pig, he just - I had my back to him and suddenly I just felt "snip", and he decided he'd cut a lock of my hair off. So that got me well uptight and I just started screaming at him and we didn't stay there that long. These diplomats just don't know how to behave. For the Anthology project, (video, 1996; book, 2000), Ringo's story remains very consistent. When he impersonates the guilty party, he puts on thick, upper-crusty, old male, English accent. The exact words are not clear to me in the video; these are the published ones. There might have been an "I say" or "sorry" in there. Ringo indicates the continuation of the man's "apology" with "b-s-, b-s-" in his own voice, faded down to a whisper. Ringo: We attended a miserable event in the British Embassy in Washington. In the early Sixties there was still a huge disparity between people from the north of England and 'people from embassies'. They were all, "Oh, very nice," a bit like Brian Epstein, and we were, "All right, lads, not so bad." But we went, God knows why. Maybe because we'd suddenly become ambassadors and they wanted to see us, and I think Brian liked the idea it was sort of big time. We were standing around saying, 'Hi, that's very nice,' and having a drink, and one of them someone came up behind me and snipped a piece of my hair off. You know, it got me angry. Why was he carrying a pair of scissors? I just swung round with a "What the hell do you think you are doing?" "Oh, it's OK, old chap... b-s-, b-s-." That was a stupid incident, wanting to cut a Beatle's hair. Q: "Now Ringo, I hear you were manhandled at the Embassy Ball. Is this right?" Q: "Let's have a look. You seem to have got plenty left." RINGO: "I don't know. I was just talking, having an interview (exaggerated voice) Just like I am NOW!" RINGO: "I was talking away and I looked 'round, and there was about 400 people just smiling. So, you know - what can you say!" JOHN: "What can you say!" On a different note, I wonder if that was the first time John was exposed to Ringo's "tomorrow never knows" philosophy. Ed Rudy supplies an interesting anecdote on the back of his The American Tour With Ed Rudy album. We don't often hear how Ringo had ripped a lady's dress at the party. Ed Rudy: While we spoke to Ringo, a dowager type came over and asked for his autograph and he obliged. When she neglected to thank him, he made a playful grab for the back of her dress, to admonish her, and ripped it wide open! An embassy secretary, pert and petite, was also in a playful mood and succeeded in sneaking up and clipping a few locks of his abundant mop-top. Sound fair to you, a snipped lock of hair in exchange for ripping a woman's dress? John Lennon: Like at the American Embassy or the British Embassy in Washington or wherever it was, some bloody animal cut Ringo's hair. I walked out of that, swearing at all of them, I just left in the middle of it. I wonder where John went in all that snow and slush. Michael Braun's account in his book Love Me Do (1964) indicates that all the Beatles left together. But before we get to that, here's an incident recounted by Michael Braun which does not relate to Ringo's clipping, but which might have gotten confused with it in John Lennon's mind some years later. Michael Braun: After appearing on several television stations, posing for photos, and signing autographs, John walks into the rotunda for a drink. As he orders it an Embassy official is 'wondering' whether he can 'prevail upon our guests to participate in our rather small but not insignificant raffle'. In the ballroom (presumably) the Beatles draw the winning raffle tickets. Michael Braun continues: As the Beatles leave the ballroom a British debutante walks up to Ringo, removes a pair of nail scissors from her purse, and snips off a lock of his hair. When reports of what had happened were printed in the British press the Embassy issued a denial. When the Beatles insisted it was true, an M.P. posted a question to the Prime Minister regarding 'the disgraceful behaviour at the Embassy'. So not only does Ringo rip a woman's dress, but he kicks the poor Ambassador when he's down. He's lucky he wasn't scalped. I wish I knew exactly what Lady Ormsby Gore meant by "all that". Here is an account by Fred Martin, a Capitol records promo man, aired on the Lost Lennon Tapes radio series. Elliot Mintz: Capitol's Fred Martin witnessed the infamous hair-cutting incident which went down after [segues to Fred Martin speaking] the concert at the coliseum, there, when the British ambassador had begged to have them come over to the embassy for a party. And they really did not want to go, and Brian Epstein finally convinced them that [it was] something they really had to do. And so we went over there and we had a caravan of limousines. Within five minutes or so some woman came running up with a pair of scissors and tried to cut a lock of hair off of him and, y'know, another half an inch one way or the other and she could have put an eye out. And that was it, "We're going." We trooped out of there back to the hotel in Washington where we were staying, the Shoreham, and had our traveling family, and had a nice big party. Sounds a bit wishy-washy to me, what anybody might say who vaguely knew that "some jerk snipped Ringo's hair at the British embassy party." The 5-minute time frame is way off from other, more detailed accounts. Paul McCartney: There were a few of them ["Hooray Henrys", whatever they are] at the Embassy. I remember girls wanting to cut bits off our hair, which was not entirely on - so there were a few little elbows in gobs. A gob is a cak'ole, if that helps. Brian Epstein: Ringo's hair is an occupational hazard. For at the sprawling, appalling British Embassy reception in Washington, there was the incident of the scissors when a guest snipped off a curl of the famous locks. George Martin: Nor were the Beatles too happy with the ensuing party at the British Embassy, whose full quota of chinless wonders behaved abominably. They would approach the boys with an off-hand "Oh, which one are you? ", and one actually got a pair of scissors and snipped off a piece of Ringo's hair while he was talking to someone else. It almost created a diplomatic incident. George Harrison's sister Louise Caldwell was there. Her account in The Beatles an oral history (1998) has Ringo storming out of the embassy, calling a cab. In those pre-cell phone days, that must have meant "hollering" for a cab. Louise Harrison: After New York, we all went to Washington. While we were there we were invited to the British ambassador's place. I remember going up this huge staircase with all these pictures of grand old people, and Ringo making some really comical remarks. The ambassador was Sir David Ormsby-Gore. He and his wife, Lady Ormsby-Gore, were very gracious and sweet. We went to a building next door where they were having a big charity ball and they asked if the boys would pick out some of the raffle tickets for prizes. I was sitting at the back of this place with Lady Ormsby-Gore, and the guys were up there at the front. The next thing I knew Ringo was all upset and angry, shooting for the door, and calling a cab. And off he went. Apparently some kid, a college student or someone, had a pair of scissors and had cut a chunk out of Ringo's hair. So he was very upset. But the rest of The Beatles stayed and did the public thing that they had to do. Beatles Book Monthly No. 9, Apr 1964, gave an almost moment-by-moment account of "What Happened in AMERICA" by "your Beatles Book Reporter." Beatles Book Reporter: On to the reception and ball at the British Embassy. Charity "do". Received by the Ambassador and Lady Ormsby-Gore--and others of the British community. [...] And into the ballroom. Chaos. Debs, duchesses society ladies all trying to grab themselves a "private" Beatle. One "lady" snipped off a lump of Ringo's hair, from behind his left ear. Ringo's response definitely unprintable. [...] Beatles, jostled and shoved, good naturedly made the draw for the raffle--and beat it quickly back to the Shoreham Hotel. Here's the account in Beatles '64 - A Hard Day's Night In America by A.J.S. Rayl. Rayl: The behavior of England's social elite on this occasion was appalling. One stately-looking woman approached Ringo with a pair of scissors, determined to clip a lock of his hair. Cursing her, Ringo ducked and saved his hair. The Beatles couldn't wait to leave. This baffles me somewhat. Detailed looks at other parts of Rayl's book show that it is very trustworthy, making rigorous use of printed first-hand accounts for every sentence. In the case of the Embassy episode, she seems to rely on Braun's account pretty heavily. So how did the debutante become a stately-looking woman, and on whose word did Ringo avoid the clipping? In February 2004, forty years after the Beatles' first visit to America, and Washington, specifically, Richard Harrington wrote an article, Rock 'n' roll fans celebrate 40 years of Beatle mania for the Washington Post. He actually tracked down the "guy" who attacked Ringo. Richard Harrington: [...] After the concert, The Beatles returned to the Shoreham Hotel to relax, have some cold cuts and change clothes before heading to the British Embassy, where Ambassador and Lady David Ormsby-Gore had invited them to hand out raffle prizes after a charity ball for the National Association for the Prevention of Cruelty to Children. Giving out the raffle prizes -- autographed copies of "Meet The Beatles" -- Starr told the winners, "If you don't like it, you can exchange it for a Frank Sinatra." In the midst of all this, a woman in a long dress produced a pair of nail scissors and snipped some hair off Starr's head, with the Ottawa Sun reporting that "she went off, squealing in a half-demented way, 'I've got his hair. ... I've got his hair.'" Now, 40 years later, the person Beatles biographer Phillip Norman described as a "clawing female," recounts the incident. Beverly Rubin (then Markowitz), an 18 year old working at the National Institutes of Health, had managed to crash the affair with her date, a local DJ. But it was very late by the time The Beatles got to the embassy. "I was yelling 'I have to go home, my dad's going to kill me,'" Rubin recalls. "My date wouldn't leave, he kept saying this was a big deal, so I figured I'd have to get myself thrown out of here. So I cut Ringo's hair all the way across the back with my nail scissors," including a little curl at the end. After Starr realized what had happened, Rubin and her date were escorted to the door. "My date was yelling about pictures and I'm going 'I've got the hair! I've got the hair!' He was 'whatever.' And I had all their autographs." According to Rubin, who now operates Bev Rubin's Little People, a collectible dolls store in Las Vegas, her treasures were all soon laminated. After a friend identified her to the press, pictures of Rubin, her scissors and Starr's hair were featured in numerous teen magazines. "I'd get fan mail from Beatles clubs asking me to give them a piece, so I was cutting my mother's hair and sending it, because I didn't want to disappoint anybody. But I kept the original hair." Now I can't prove that story isn't true, but it sounds a bit fishy. Ringo must have been a Madame Tussaud's wax dummy to let someone cut all the way across the back of his hair with nail scissors before detecting anything amiss. Note that not a single one of the first-hand accounts describes the attacker as a teen-aged American girl. I'm guessing the party was not that easy to crash; journalists had to pay to get in - and even then were roughly treated inside. This all brings to my mind Bob Wooler's humorous comment about Alistair Taylor's claim that he, Alistair himself, was the elusive Raymond Jones who came into Brian Epstein's record shop one day asking for My Bonnie. With apologies to Bob Wooler: "Let's all do this. Let's all say, I am Spartacus, and claim to be the one who snipped Ringo's hair." Press photo taken in parents' basement, 1964. 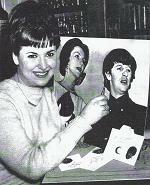 This pretty miss demonstrates how she used her nail scissor to snip a curl off of Ringo's Beatle locks. "If they keep it up," Ringo complains, "I won't have any hair left." This girl has the distinction of having barbered a Beatle. Beverly Markowitz, age 18, of Silver Springs, Maryland, uses an enlarged photo of Ringo Starr to demonstrate how she snipped off a lock of his hair. Miss Markowitz said she crashed a British Embassy party held for the Beatles in Washington on February 11th, and sneaked close enough to Ringo to snip off a curl with her nail scissors. The curl is taped to the card (lower right) which Ringo had autographed before the hair snipping episode. The woman in the photo with Ringo is the wife of the British Ambassador, Lord Harlech. So, I guess we need a DNA test on Ringo's curls. I'm also curious about any other details the Ottawa Sun article has to offer. Maybe the thing I'm most baffled about is, was anybody NOT at the British Embassy that night??? Hunter Davies, in his authorized biography of The Beatles covering the years through 1967, prefaces his passage on the incident with this statement. Very interesting, considering how few years after the incident it had been, and his access to all the Beatles. That says to me we'll never know, but if anyone has any convincing source material, please share it with the rest of us. Helpful keywords not in the main text: bev rubin; bev markowitz.